The HSE 2013 First Aid Guidelines for Employers from the Health and Safety Executive recommend a first aid needs assessment that will identify what type of first aid training your first aiders will need, how many first aiders you need and where they should be located. One of the more complicated areas of the new first aid needs assessment is considering ‘the nature of the work, the hazards and the risks’. You should consider the risks and identify what possible injuries could occur in order to ensure sufficient first aid provision is available. You should ensure that your first aiders are trained to deal with the injuries and illness that could occur. Extra, specialised training and provision may be needed for hazards such as chemicals, dangerous machinery, working in confined spaces etc. You should also consider the possible illnesses that could occur in the workplace and ensure you have adequate provision. You should look at the organisations history of accidents and illness to try and identify any needs or trends that may influence the location or type of first aider. Different levels of provision may be required in different areas of the workplace. First Aid should be available wherever people work so you may need to consider providing personal first aid kits or training to travelling, remote or lone workers. Adequate first aid cover should be available whenever people are at work. There may be circumstances when a higher level of cover is needed when less people are at work, such as overnight maintenance work in a normally low risk environment. First Aiders should be able to reach the scene of an incident quickly. Consider extra first aiders on large sites, sites with multiple buildings or buildings with multiple floors. If the workplace is remote from emergency medical services you may need to make special transport arrangements should an incident occur. Consider how employees will summon help – do they have access to a phone? Even in urban areas you should be aware that it often takes more than 10 minutes for an ambulance crew to reach a casualty, so the correct provision of first aid is a vital link in reducing the effects of illness or injury. On shared work sites it may be possible to share first aid provision, such as the security team providing first aid cover at a large shopping centre. It is important to fully exchange details of the hazards and risks so that adequate first aid cover is provided. Make agreements in writing to avoid misunderstandings. You should ensure that adequate first aid cover is available at all times, including when a first aider is on annual leave, a training course, a lunch break or other foreseeable absences. This generally means that workplaces need more than one first aider to ensure that cover is maintained. 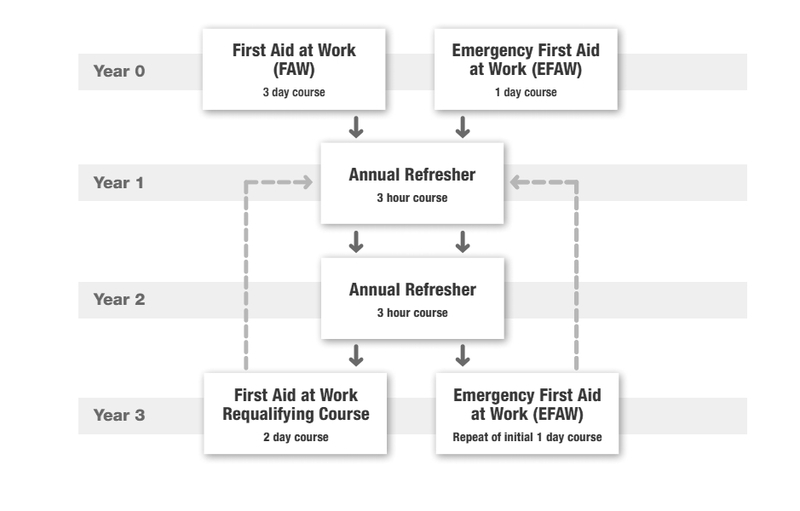 If your first aid needs assessment identifies the need for a ‘First Aider at Work’ (18 hour course), it is not acceptable to provide an ‘Emergency First Aider at Work’ (6 hour course) to cover foreseeable absences. You should also consider what cover is needed for non-planned absences such as sick leave. The HSE recommend that you include non-employees in your first aid needs assessment. You should consider the duty of care that you assume when a non-employee visits your site. This is particularly relevant if you provide a service for others such as schools, places of entertainment, shops etc. Consider both the injuries and illnesses that could occur. For large events such as concerts, organisers have a duty of care to ensure that adequate medical, ambulance and first aid cover is available. Organisers of such events should refer to The Event Safety Guide, published by HSE books, for further information. The number of people on a site should no longer be the primary basis for determining first aid needs; all the areas of the new first aid needs assessment should be carefully considered. However, in general terms the larger your organisation is, the more first aiders you will need. That ‘manual’ workplaces (light assembly work, warehousing, food processing or higher risks), have a minimum of one first aider on duty at all times per 50 people (or part thereof). It is likely that if your workplace is large you will have already identified the need for full FAW (18 hour) training for your first aiders; but in any case, due to the increased probability of illness and injury occurring in larger workplaces, the HSE recommend that full FAW (18 hour) training is provided in workplaces with 50 or more people. You should review your first aid needs from time to time, particularly if you have operational changes in your workplace. It is recommended that a record is kept of incidents dealt with by first aiders to assist in this process. The way that you should carry out a First Aid Needs Assessment (employers must do this by law). There are now two types of approved First Aider. The introduction of annual refresher training. Where can I see examples of first aid needs assessments? Examples of assessments for a range of different settings are available here. Do I need to re-train my existing ‘First Aid at Work’ first aiders? Existing First Aid at Work Certificates will still be accepted by HSE, so you only need to retrain existing staff as their certificates expire (when they will move onto the new training regime). You may wish to consider annual refresher training for your existing first aiders, which falls in line with the new guidance. 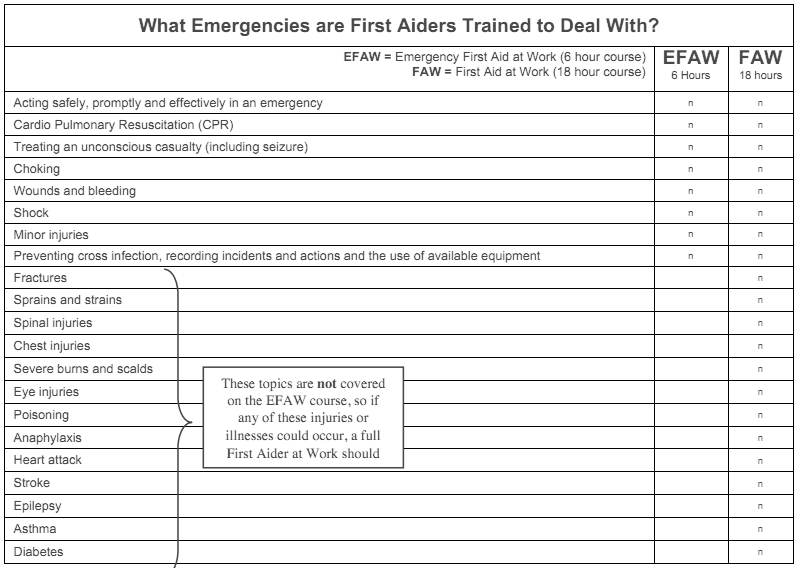 My First Aid Needs Assessment says I need Emergency First Aiders; do I have to retrain my Appointed Persons on this course? If your Appointed Persons were trained by REAL First Aid, we guarantee that they have completed all the topics on the EFAW course, so you can justify using them as ‘Emergency First Aiders’ until their existing certificates expire, when you should re-train them on the EFAW course. You may however wish to consider annual refresher training for your appointed persons to fall in line with the new guidance. What if a First Aid at Work Certificate has expired? Your First Aider at Work (FAW) can attend the 2 day re-qualification course up to 3 months before or 28 days after their current certificate expires. The new certificate will be valid from when the old one runs out. If the certificate expires by more than 28 days the First Aider must attend the full 3 day initial course. The Emergency First Aid at Work course doesn’t cover all the topics that my first aiders need to learn. Can you add topics to this course? Yes; if we run a course at your premises we can tailor it to your needs. However, we would need to add extra time to the course to cover extra topics. Please give us a call if you would like to discuss your needs. Do I need a Defibrillator on my premises?